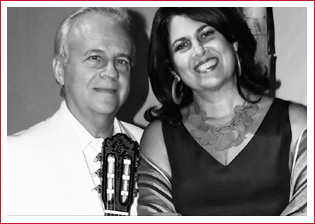 Miami Classical Guitar Society is pleased to present: Duo CARLOS MOLINA and MARISA MOLINA (soprano) in concert! 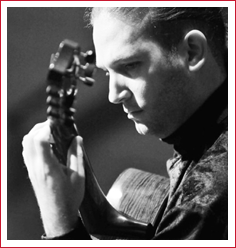 With a successful and extensive career, CARLOS MOLINA has performed solo concerts in prestigious halls such as the Kennedy Center in Washington DC, the Metropolitan Opera House in New York as solo guitarist with Alicia Alonso and the National Ballet of Cuba, Saint Petersburg Philharmonic Major Hall, Dvorak Hall of Prague, Ateneo of Madrid, Chopin Hall of Warsaw, Zeneakademia of Budapest, Hall of Mirrors at Palatial Palace in Bratislava, Salle du Conservatoire d’Orleans, Sala Carlos Chávez in Mexico, Teatro Amadeo Roldán in Cuba, among many others. Molina has shared concerts with Alirio Díaz, Leo Brouwer, Turibio Santos, Benjamin Verdery, Carlos Barbosa-Lima, Nikita Koshkin, Ricardo Gallén and others. In 1999, Marisa and Carlos had their first duo performance in Europe at the Conservatoire Britten of Périgueux, France. In 2001, they performed a concert in Miami with original music for voice and guitar dedicated to Joaquín Rodrigo’s100th birthday. Since then, they have been featured at many international festivals in Vélez-Málaga, Coria, Hondarribia, and Aranda del Duero in Spain; Rome, Cassino, Ceccano, San Angelo, Fiuggi, Potenza, Bisceglie, and Pescara in Italy, Universidad de Veracruz, Eastfield College in Dallas, and the Miami Classical Guitar Society Series. The Molina Duo was invited to the Alirio Diaz International Festival in Carora, Venezuela, Serate Musicale in Sardinia, and the Festival “Due Citta” in Rome, Italy. This past summer they were featured again at the X Festival Internazzionale di Fiuggi. 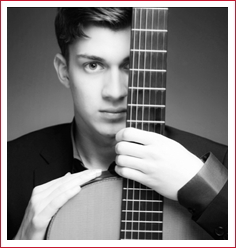 Miami Classical Guitar Society proudly presents: Cuban / Austrian Maestro MARCO TAMAYO! 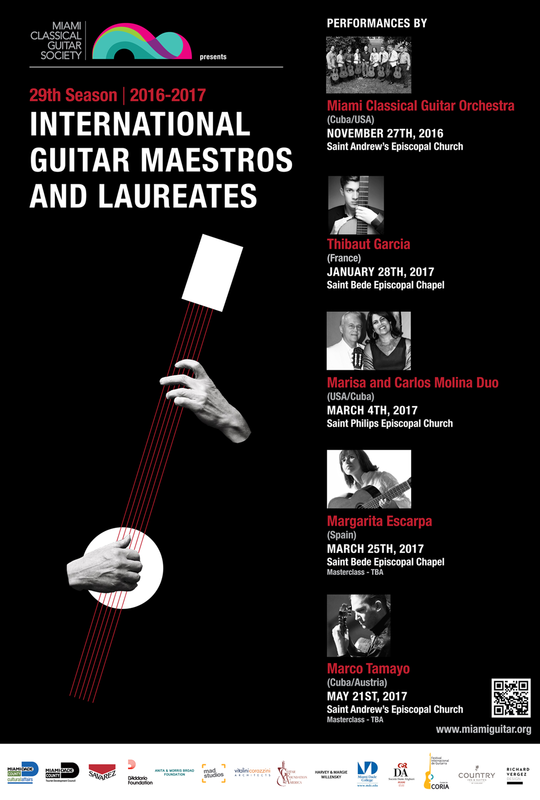 Winner of some of the most important international competitions, including the Michelle Pittaluga, Citá di Alessandria, in Italy; Blas Sánchez, Paco Marín and the Andrés Segovia in Spain; Nikita Koshkin in Rust, Austria; and the Leo Brouwer International Competition in Havana; Cuban/ Austrian guitarist MARCO TAMAYO is acclaimed as the “king of the guitar” by the Italian review L'Stampa. In addition to his solo concerts, Tamayo has performed with numerous symphonic orchestras around the world, and is considered one of the leading guitarists of our time. He is a professor at the Mozarteum in Salzbourg and the Landeskonservatorium of Klagenfurt, Austria, and also visiting professor at the Music Academy of Gdansk, Poland, and the University of Sydney, Australia. He also is artistic director of the Michelle Pittaluga International Competition in Alessandria, Italy and Honorary citizen of Alessandria and Solero. Tamayo has studied with Antonio Alberto Rodríguez, Eliot Fisk, Joaquin Clerch, Leo Brouwer, N. Harnoncourt, A. Spiri, K. Gilbert, R. Schmidt, K. Hagen, and others. He wrote and published the book, "Principios Esenciales para la interpretación en la guitarra clásica" which has transformed and added a new vision for the instrument and its teachings. Tamayo plays a Marty Simon guitar and uses blue Cantiga Alliance strings by Savarez. He is President of the Marco Tamayo Edition, created in 2014. (Discounts: members, seniors, students with ID). Children under 12 are free. No Reservations needed. Email: info(at)miamiguitar.org / Subject Line: "Masterclass Performer Registration – Marco Tamayo". (Masterclass Performers will receive a special $15 ticket for Marco Tamayo Concert). MASTERCLASS AUDITORS: Open to the Public. Auditor Tickets - $10 at the door. Free Audit for MCGS Members. Ticket includes audit for entire day. 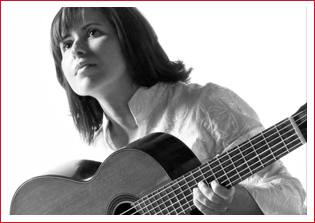 Miami Classical Guitar Society proudly presents: Spanish virtuoso MARGARITA ESCARPA! “A first class artist,” said María Luisa Anido of MARGARITA ESCARPA when she first heard play in 1990. Since then, Margarita has reaped many successes and she is now considered one of the main contemporary classical guitarists. Escarpa won the Extraordinary End of Studies Prize of the Royal Superior Music Conservatory of Madrid, and shortly after, she obtained her Bachelor’s degree in mathematics from the Universidad Autónoma de Madrid. While still a student, she won eight international prizes in addition to various national ones. Her triumph in the international 20th Solo Guitar Competition of the Guitar Foundation of America was a decisive moment in her career as a performer, and ever since she has been at the top of the international guitar scene. She regularly participates in the most important festivals of Europe, Asia and America. Major prizes include First Prize of the prestigious Guitar Foundation of America International Guitar Competition in 1994, the Certamen Internacional Andrés Segovia in Granada in 1994, Concurso Internacional Andrés Segovia in Palma de Mallorca in 1993, Concours International de Guitare of Radio France in 1992, Esztergom International Competition in Hungary in 1991, and the Concurso Internacional Alhambra in Alcoy in 1990. Margarita Escarpa masters a broad solo and orchestral repertoire and her talent and character turns every performance into a unique musical experience. Arturo Tello Ruiz-Pérez confirms that Escarpa rightly occupies the highest echelons of the guitar Parnassus. As a soloist, she has recorded with Naxos, RTVE, Ópera Tres, GHA Records and Maricam Studio. She presently teaches at the Superior Music Conservatory of Vigo, Spain. Escarpa is also known as a dedicated teacher and in addition to her frequent master classes she directs the Guitar Department of the Superior Music Conservatory of Vigo, Spain. Email: info(at)miamiguitar.org / Subject Line: "Masterclass Performer Registration – Margarita Escarpa". (Masterclass Performers will receive a special $15 ticket for Margarita Escarpa Concert). Born in Toulouse, France, Thibaut Garcia began to play the guitar at the age of seven. Garcia credits his Spanish origins as a primary influence on his way of thinking. He studied in Toulouse where he received his chamber music diploma under the tutelage of Renaud Gruss, and his guitar diploma, with academic honors, under Paul Ferret. At sixteen, Garcia entered the Conservatoire National Supérieur de Musique et de Danse de Paris, where he would complete his Bachelor’s, with academic superlatives, with Olivier Chassain. He currently studies privately with Judicaël Perroy. In part of his competition accolades, Garcia has already begun an international concert career, having performed in France, Spain, England, Germany, Romania, Hungary, Canada, United States, Brazil, Greece, Argentina, Mexico, Russia, and China. In the fall of 2016, Garcia will begin a tour of over fifty concert dates in the United States and Canada as part of his prize for winning the 2015 Guitar Foundation of America International Concert Artist Competition. His first recording, “Demain dès l’aube” (Tomorrow At Dawn) was produced by the Contrastes label in 2014 and features a unique program of Bach, Berio, and Regondi. In 2016, Garcia will release his major-label debut with a recording for Warner Classics entitled Leyendas (Legends). In his native France, Garcia was recently featured on La Boîte à Musique (The Music Box) where he was invited to perform on national television by Jean-François Zygel. In December 2015, he also performed on France Musique for Gaëlle Le Gallic’s program. Garcia was also recently awarded the distinction of “filleul” (Godson) by the Académie Charles Cross, a cultural organization that acts as an intermediary between goverment policy makers and professional musicians in France. CONCERT TICKETS: $30 at the door. (Discount for members, seniors, students with ID). The Miami Classical Guitar Society is proud to present the MIAMI CLASSICAL GUITAR ORCHESTRA (MCGO) conducted by Maestro Carlos Molina. This unique professional guitar orchestra was created in 2014 by Molina, with graduates from the Superior Institute of the Arts (ISA) with outstanding careers as soloists, duets and ensembles in Cuba and internationally. They have performed individual concerts in different countries around the world, including Russia, Czechoslovakia, Austria, Germany, France, Italy, Spain, Portugal, Mexico, Costa Rica, Ecuador, and others. Moreover, all orchestra members work in the Miami area, contributing to our community’s cultural development. The MCGO will be performing music from Vivaldi, Albeniz, Falla, Piazzolla, Lecuona and others, including some wonderful surprises. Molina, an experienced conductor in the field, began this work in 1991 at the GFA Guitar Festival of the Americas he directed at FIU, and has been conducting guitarists ever since in Miami and at international festivals in Germany and Spain. 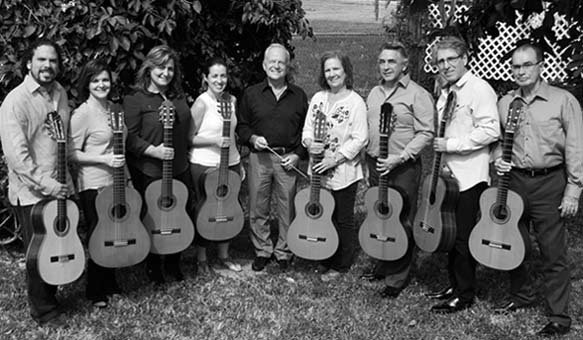 MIAMI CLASSICAL GUITAR SOCIETY is a 501c3 non-profit cultural organization, brought to you with support from our SPONSORS - 29th Season: Miami-Dade County Department of Cultural Affairs and the Cultural Affairs Council, Miami-Dade County Mayor and the Board of County Commissioners, Savarez Strings, The D'Addario Music Foundation, Anita and Morris BROAD FOUNDATION, MAD Design Studios, Societa Dante Alighieri, Country Inns and Suites, Vitalini Corazzini PA, Harvey & Margie Willensky. In Collaboration With: Guitar Foundation of America, USA; Ciudad de Coria International Guitar Festival, Spain.